I'm attempting to install Phalcon Dev Tools on OSX. I have Phalcon installed and it works fine. Make sure phalcon.sh is in the same dir as phalcon.php and that you are     running this with sudo or as root. Now how do I use the devtools? When I enter phalcon commands the output is exactly the same as above, and continues to tell me that it's installed. So, if check_install passes, run phalcon.php. I've tried to run this script manually and nothing happens at the terminal. $PTOOLSPATH is defined. I confirmed this using echo $PTOOLSPATH. Running php -m showed me Phalcon isn't installed. Which is odd, because I am using Phalcon in my web application, and it works fine. As you can see, I've loaded the extension in the php.ini. Basically, the link shouldn't be the script but the php file. Fixing that, I could run the dev tool properly. I have the same problem with you. and I solved it as long as I add this two line into my ~/.bash_profile file. At first, I only add the first line into .bash_profile, and I got the same information with you. May be in command line ini file phalcon is not installed so it is throwing error. just type this command in terminal . is loaded there as well or not. 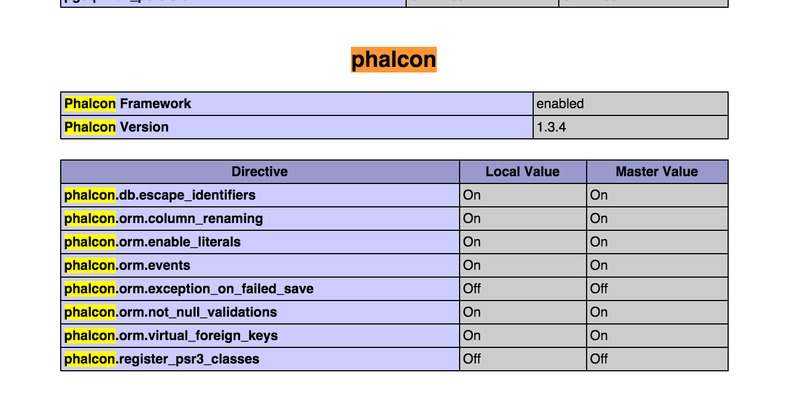 as for web and cli there are different phalcon.so file is provided so we need to inlcude "phalcon.so" in both files. so phalcon.so is included in your web php.ini so its running smooth there and not it command line i guess.